Through La Fábrica—the Madrid-based publishing house he also directs, journalist Alberto Arnaut aims to incite a cultural debate in Matador, or in his own words a “campo de batalla” (battlefield) for ideas in all genres. The work of painters, sculptors, photographers, novelists, poets, playwrights, essayists, philosophers, architects, filmmakers, actors, chefs, musicians, fashion designers, and more adorn the pages of the lavish folio-size issues. Published annually since 1995 beginning with the letter A, the publishers are committed to completing 28 issues in 2022 when they reach the letter Z. 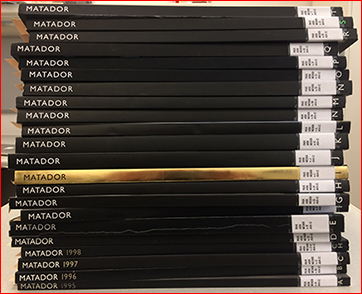 It is difficult to describe what takes place in Matador until you put your hands on an issue. Other than the dimensions, no issue is alike and each takes on a distinct theme. The magazine is predominantly visual with an emphasis on creators from the Iberoamerican world such as artists Miguel Barceló, Luis Gordillo and Eduardo Chillida; photographers Francesc Català-Roca, Xavier Miserachs, Ramón Masats; and filmmakers Bigas Luna and Gonzalo Suárez. However, contributions from all the continents establish an international dialogue. The words of contemporary fiction writers such as Javier Marías, Juan Goytisolo, Elena Poniatowska, and Juan Villoro engage with the deceased such as Rafael Alberti, Clarice Lispector, José Saramago and others. The texts of French theoreticians Hélène Cixous and Paul Virilio and the Department of Spanish Portuguese’s own Alex-Saum Pascual can also be encountered in Matador. This year, the Art History/Classic Library was able to acquire all issues to date (A-T) as a joint purchase with the Romance Languages Librarian and is now one of only three libraries in California with a full-run and subscription. The Beckett Digital Manuscript Project reunites the manuscripts of Irish writer Samuel Beckett’s works in a digital way, and facilitates genetic research. 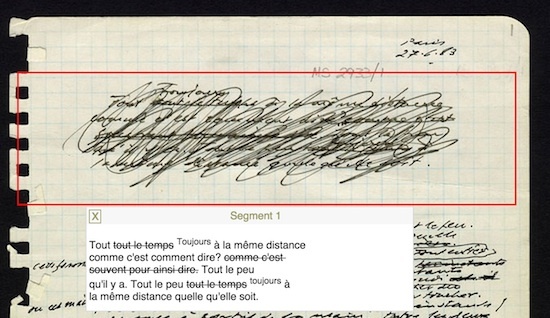 The project brings together digital facsimiles of documents that are now preserved in different holding libraries, and adds transcriptions of Beckett’s manuscripts, tools for bilingual and genetic version comparison, a search engine, and an analysis of the textual genesis of his works. Beckett wrote in both English and French. The site also includes the Beckett Digital Library (BDL) – a digital reconstruction of Samuel Beckett’s personal library, based on the volumes preserved at his apartment in Paris, in archives (Beckett International Foundation) and private collections. It currently houses 761 extant volumes, as well as 248 virtual entries for which no physical copy has been retrieved.